I'm an American teaching English in Budapest, Hungary. My life is quite an adventure, and I share it in all its humorous glory on this site. Budapest Bridge Becomes a Playground 11 months ago The bridges over the Danube are one of the most amazing parts of Budapest. And they get even better when they close to have a party! A Ferry Through Budapest's History 1 year ago Budapest used to be a place that depended on ferry boats, but times have changed. For a limited time, however, the opportunity was back! The Conductor Who Jumps Between Train Cars 1 year ago Instead of watching Indiana Jones, go live the adventure! All you have to do is take a ride on this train. Going Underground with a MÃ¡d Winemaker 1 year ago Wine tasting is usually a fun relaxing at activity. In this case, it was a lot more exciting than expected. The Best Place for Sunbathing in a Castle 1 year ago A royal title comes with all kinds of obligations and responsibilities, but have you ever thought how hard it must be to choose the location of your castle? 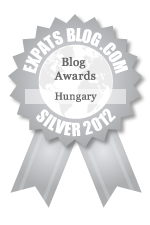 ExpatsBlog.com Expat Blog Awards 2012: Hungary Silver Award! This blog won the Silver Award for best expat blog in Hungary! Th blog is a must-read, and whenever a new post goes up, I'm pretty sure I'm always one of the first to read it. If I weren't already living in Hungary, I definitely would've moved it to the top of my list to live/visit because of Alex's blog! I have been living here for 4 years now, but Alex's blog makes me realize that I have so much to learn, very informative and concise. Alex keep up the good job! I've been following Alex's blog for years now, and it's been a fantastic way to see Europe and Hungary through his eyes. He's taking a bit of the USA with him, and bringing us back a lot of foreign culture in exchange. Alex Will Travel? More like Alex Will Win! I've traveled with Alex and truly enjoy his sense of adventure and knack for story telling. His laid-back personality makes for good travels and great retellings. It's been two years since we traveled together yet I still read his posts and travel vicariously through his continued adventures. You're always guaranteed a good read on AlexWillTravel! Reading Alex's travel blog never ceases to amuse me. He writes with a hilarious tone and I often find myself in fits of laughter from reading his words. Sometimes his blog makes me want to sell all my things and move to Hungary immediately. Thanks for sharing your stories! I LOVE reading Alex's blogs. Not only are they very well written,they are amusing, humorous, and extremely entertaining. And the pictures are wonderful. His stories are always so interesting and informative. He should write a book!! Well, I had been an expat in Germany, in the Netherlands and for 8 years in the United States. So, besides knowing why and what to appreciate in an expats life, it is also fascinating to see how somebody lives as an expat here in Hungary. It is really entertaining and also useful to see how to get over the barriers that one faces when being far from home. Why not call Hungary your second home, Alex? I am Alex' s native hungarian fan. I do enjoy his stories about us . Through his eyes i learned to see my nation in a different way. Thanks, Alex. I love Alex's blog! It's interesting, insightful, entertaining, funny, and the photos are great. I've never traveled to Hungary but Alex Will Travel sure makes me want to visit. Alex has a great eye, not only for photography, but for understanding what's happening around him. What makes his blog a delight to read is his ability to translate his perception to the page. Thank you for educating us about Hungary! Extremely entertaining stories about living and traveling in Hungary that stimulate your imagination. Makes me want to visit every place that Alex writes about. And the photos are a perfect match for the writing, both are great. Alex captures his experiences in a positive, informative way while always adding a twist of humor that keeps me coming back to read each post. Before we moved to Hungary we did tons of research, and Alex's blog was one of the most helpful resources we found. I love to hear the stories about Hungary, it makes me want to be there. There is much information, given with a sense of humor which makes you want to read more. I love reading Alex's blog, and learning about his life in Hungary. He brings his readers along on everyday activities and makes the story into a humorous adventure. Great pictures, too! Your Name Do you think this blog has what it takes to be listed at the top of Expats in Hungary Blogs?